Whether you’re growing cereals or high-end speciality crops, you’ll be able to configure your ideal M944i Series trailed sprayer the most cost-effective way; with the perfect specification for your operations. No more, and no less than you need, and no unnecessary outlay for superfluous technology. That’s the philosophy behind our new M900/M900i trailed sprayer. Equipped with the optional GreenStar 3 2630 touch-screen display, your M944i boosts your productivity throughout the entire crop protection cycle – from documentation and filling to transport, spraying and rinsing. 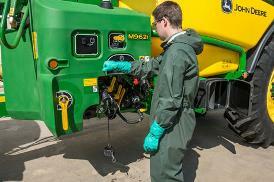 The M900 and M900i Sprayers offer the right answer for many crop care process needs. A wide range of configuration possibilities is available to match various value chain requirements. Investments can be made where they are needed the most. To keep crop protection input cost under control, the M900 and M900i are prepared for automatic section control whether an ISOBUS-ready tractor or a standard tractor is connected. When it comes to uptime, the M900 Series is designed based on the same insights as the John Deere R900i platform, using similar proven components such as tank, boom, frame, and axles to meet quality and reliability levels that are expected from a high-quality trailed sprayer. From filling up to spraying and rinsing, the ergonomic layout of the operator’s station with manual valves or semi-automatic valves will command the liquid in the right direction. The round-shaped polyethylene tank is fully cradled by the frame and gives the machine a low center of gravity; this comes together with the double-linked ProRoad axle suspension, providing stability needed on the road and in the field. The M944's 4400-L (1163-gal.) and the M952's 5200-L (1374-gal.) tank sizes combined with the full-range durable steel spray booms from 24 m to 40* m (79 to 131 ft) allows the operator to cover the field quickly and accurately. High-capacity PowrFill™ chemical inductor hopper. Fully welded rims for wheels and tires. John Deere's standard ProRoad axle suspension comes with a double-linked axle that limits perpendicular movements and ensures superb behavior on the road and in the field. The maintenance-free polyurethane dampers absorb the energy of bumps or shocks. 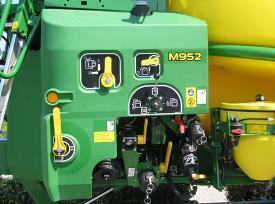 This provides stability and comfort whether operating with either a full or with an empty tank. 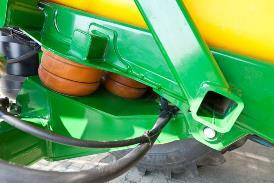 Damage to taller crops is significantly reduced since the axle is not the lowest point on the sprayer. Ergonomic operator’s station design makes operation fast and easy. All levers are grouped together and with the large handles, setup is quick. The operator’s station is available in manual control with additional automation options possible when it comes to filling, agitation, or dilution. The easy-to-set manual valves speed up spraying operations and automation options will help to make filling, spraying, and rinsing even faster, easier, and more accurate. The standard non-return check valve in the system prevents a back flow through the filling hose. This smart solution prevents point-source pollution, chemical spillage, and protects the environment. The PowrFill™ chemical inductor hopper, spray gun, and clothing lockers are partly stored behind the valve area. Filters, and hose connections are easily accessible for operation, cleaning, or maintenance. With the optional automatic filling, the required liquid content can be easily programmed to the actual needs on the in-cab display. During filling, a digital tank-level sensor accurately measures all the liquid entering into the tank. Once the required volume is reached, the automatic filling process stops, and if needed warns the operator with a horn that filling is complete. At the same time the system automatically redirects pump suction to the solution tank for additional mixing. The digital tank-level sensor monitors the total tank content; at the nominal volume filling valve will close automatically to prevent overflow. The automatic filling option also includes automatic agitation control, AutoDilute stepwise or continuous dilution, in addition to the digital tank-level sensor for accurate readout and system control. Intelligence provides premium precision and boosts productivity in a smarter way. 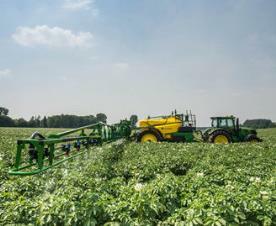 John Deere’s M900 or M900i Trailed Sprayers can be configured with intelligent features and integrated solutions that make spraying operations faster, easier, and more accurate. With intelligence using both flow and pressure sensors on board, the sprayer can automatically select the most accurate type of rate control for the job, or provide real-time information on the actual droplet size, even send a warning whenever accuracy tends to go out of range. John Deere BoomGuard holds the boom gently but firmly during transport, minimizes boom movements in vertical or horizontal direction to prevent yaw when spraying. M900 and M900i Trailed Sprayers have optional automatic filling and AutoDilute; additionally, the i-package is available with the M900i. All offer additional comfort and automation while saving time and valuable input costs. 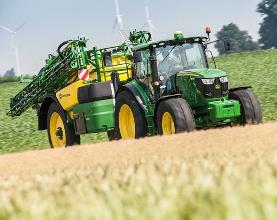 With the M900i Trailed Sprayer, ISOBUS control and either the Gen 4 4240 or 4640 Universal Displays, John Deere’s innovative FarmSight™ solutions overarch the crop protection process with a high level of process data and control. 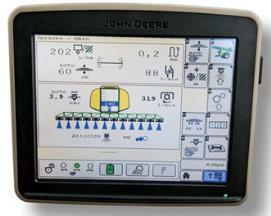 With the myjohndeere.com Operations Center, operators can easily set up, track, and document the crop protection process. Once data is transferred to the machine, the operator can quickly and easily perform sprayer functions including filling, variable rate spraying, and documentation. 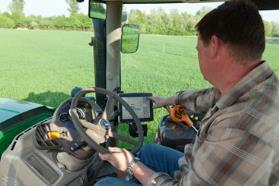 In the field, the sprayer makes all the adjustments in real-time. 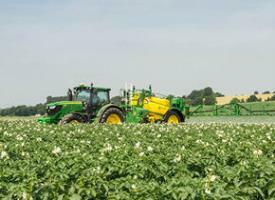 This leaves operators free to focus on spray quality and productivity. Guidance solutions, such as Parallel Tracking system or AutoTrac™ assisted steering system reduce overlap and skips to save on input costs. 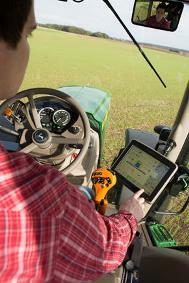 Intelligent sprayer features provide spray accuracy and offer premium precision. Automatic boom control systems, TerrainControl™ Pro and TerrainCommand™ Pro, improve spray quality by automatically positioning the boom precisely where it is needed for maximum coverage and minimum spray drift. Gen 4 4240 and 4640 Universal Displays offer integrated control and provide spray to map (prescription mapping) solutions and documentation capabilities. Keep cost under control: intelligent solutions reduce input cost and enabling increased productivity. 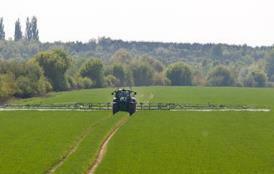 Automatic section control is a solution to optimize crop protection quality and extend the available spray window. TerrainControl™ Pro and TerrainCommand™ Pro automatic boom levelling systems, in-cab nozzle control, and light-emitting diode (LED) work lights are additional solutions offered for the M900 and M900i Trailed Sprayers. 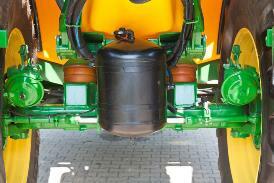 Integrated solutions on the M900 or M900i, collectively cooperate to optimize crop protection. Automatic section control or SprayerPro™ will switch the sections automatically in predefined areas saving valuable input cost. 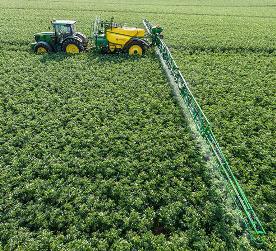 On the M900i Trailed Sprayers, TerrainControl Pro controls adjust boom tilt and boom height to optimize spray boom position in various field circumstances. TerrainCommand Pro adds automatic variable geometry control for precise boom control, even in undulating and extreme conditions. TwinSelect™ in-cab nozzle selection adds convenience for switching nozzles in between jobs or to meet drift classification at field boundaries. Powerful work lights with LED technology provide a good view of the boom during night spraying for precision and practicality. Automatic section control is available for M900 and M900i. TerrainControl Pro precisely controls boom height and tilt. TerrainCommand Pro handles variable geometry control, taking away stress in undulating conditions. 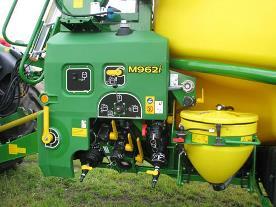 TwinSelect in-cab nozzle control allows for fast switching and increased productivity. LED working lights provide the visibility needed to get the job done after dark. 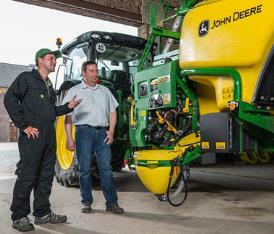 John Deere's award-winning multi-cycle dilution system for controlled residue disposal is an equipment option on the M900 Sprayer.